Now, I should warn you all that I’ve been spending time with Steve Wheeler (@timbuckteeth) and we agree on many things, so I’m either going to be in furious agreement with him or I will be in shock because he suddenly reveals himself to be a stern traditionalist who thinks blended learning is putting a textbook in the Magimix. Only time will tell, dear reader, so let’s crack on, shall we? Steve is from the Plymouth Institute of Education, conveniently located in Plymouth University, and is a ferocious blogger and tweeter (see his handle above). Steve started with the idea that on-line learning is changing and that his presentation was going to be based on the idea that the future will be richly social and intensely personal. Paradoxical? Possibly but let’s find out. Oh, look, an Einstein quote – we should have had Einstein bingo cards. It’s a good one and it came with an anecdote (which was a little Upstairs Downstairs) so I shall reproduce it here. There are two types of learning: shallow (rote) learning that we see when cramming, where understanding is negligible or shallow if there at all, and then there is the fluid intelligence, the deeper kind of learning that draws on your previous learning and your knowledge structures. But what about strategic learning where we switch quickly between the two. Poor pedagogy can suppress these transitions and lock people into one spot. There are three approaches here: knowledge (knowing that, which is declarative), wisdom (knowing how, which is procedural) and transformation (knowing why, which is critical). I’ve written whole papers about the missing critical layer so I’m very happy to see Steve saying that the critical layer is the one that we often do the worst with. This ties back into blooms where knowledge is cognitive, wisdom is application and transformation is analysis and evaluation. Learning can be messy but it’s transformative and it can be intrinsically hard to define. Learning is many things – sorry, Steve, not going to summarise that whole sentence. We want to move through to the transformational stage of learning. What is the first attempt at distance learning? St Paul’s name was tossed out, as was Moses. But St Paul was noted as the first correspondence course offered. (What was the assessment model, I wonder, for Epistola.) More seriously, it was highly didactic and one-way, and it was Pitman who established a two-way correspondence course that was both laborious and asynchronous but it worked. Then we had television and in 1968, the Stanford Instructions TV Network popped up. In 1970, Steve saw an example of video conferencing that had been previously confined to Star Trek. I was around in the early 70s and we were all agog about the potential of the future – where is my moon base, by the way? But the tools were big and bulk – old video cameras were incredibly big and ridiculously short lived in their battery life… but it worked! Then people saw uses for the relationship between this new technology and pedagogy. Reel-to-reel, copiers, projectors, videos: all of these technologies were effective for their teaching uses at the time. Of course, we moved on to computer technology including the BBC Model B (hooray!) and the reliable but hellishly noisy dot matrix printer. The learning from these systems was very instructional, using text and very simplistic in multiple choice question approach. Highly behaviouristic but this is how things were done and the teaching approach matched the technology. Now, of course, we’ve gone tablet-based, on-line gaming environments that have non-touch technologies such as Kinect, but the principle remains the same: over the years we’ve adapted technology to pedagogy. But it’s only now that, after Sir Tim Berners-Lee, we have the World Wide Web that on-line learning is now available to everybody, where before it was sort-of available but not anywhere near as multiplicable. Now, for our sins, we have Learning Management Systems, the most mixed of blessings, and we still have to ask what are we using them for, how are we using them? Is our pedagogy changing? Is out connection with our students changing? Illich (1972) criticised educational funnels that had a one-directional approach and intend motivated educational webs that allow the transformation of each moment of living into one of learning, sharing and caring. What about the Personal Learning Environment (PLE)? This is the interaction of tools such as blogs, twitters and e-Portfolios, then add in the people we interact with, and then the other tools that we use – and this would be strongly personal to an individual. If you’ve ever tried to use your partner’s iPad, you know how quickly personalisation changes your perception of a tool! Wheeler and Malik (2010) discuses the PLE that comprises the personal learning network and personal web tools, with an eye on more than the classroom, but as a part of life-long learning. Steve notes (as Stephen Heppel did) that you may as well get students to use their PLEs in the open because they’ll be using them covertly otherwise: the dreaded phone under the table becomes a learning tool when it’s on top of the table. Steve discussed the embedded MOOC that Hugh discussed yesterday to see how the interaction between on-line and f2f students can benefit from each other. In the late ’80s, the future was “multi-media” and everything had every other medium jammed into it (and they don’t like it up ’em) and then the future was going to converge on the web. Internet take up is increasing: social, political and economic systems change incrementally, but technology changes exponentially. Steve thinks the future is smart mobile and pervasive, due to miniaturisation and capability of new devices. If you have WiFi then you have the world. Looking at the data, there are no more people in the world with mobile phones than people without, although some people have more than one. (Someone in the audience had four, perhaps he was a Telco?) Of course, some reasons for this are because mobile phones replace infrastructure: there are entire African banks that run over mobile networks, as an example. Given that we always have a computer in our pocket, how can we promote learning everywhere? We are using these all the time, everywhere, and this changes what we can do because we can mix leisure and learning without having to move to fixed spaces. Steve then displayed the Intel info graphic “What Happens In an Internet Minute“, but it’s scary to see how much paper is lagging these days. What will the future look like? What will future learning look like? If we think exponentially then things are changing fast. There is so much content being generated, there must be something that we can use (DOGE photos and Justin Bieber vides excepted) for our teaching and learning. But, given that 70% of what we learn is if informal and outside of the institution, this is great! But we need to be able to capture this and this means that we should produce a personal learning network, because trying to drink down all that content by yourself is exceeding our ability! By building a network, we build a collection of filters and aggregators that are going to help us to bring sense out of the chaos. Given that nobody can learn everything, we can store our knowledge in other people and know where to go when we need that knowledge. A plank of connectivist theory and leading into paragogy, where we learn from each other. This also leads us to distributed cognition, where we think across the group (a hive mind, if you will) but, more simply, you learn from one person, then another, and it becomes highly social. Steve showed us a video on “How have you used your own technology to enhance your learning“, which you can watch on YouTube. Lucky old 21st Century you! This is a recording of some of Steve’s students answering the question and sharing their personal learning networks with us. There’s an interesting range of ideas and technologies in use so it’s well worth a look. Steve runs a Twitter wall in his classroom and advertises the hashtag for a given session so questions, challenges and comments go out on to that board and that allows Steve to see it but also retweet it to his followers, to allow the exponential explosion that we would want in a personal learning network. Students accessed when they harness the tools they need to solve their problems. Steve showed us a picture of about 10,000 Germans taking pictures of the then-Presidential Elect Barack Obama because he was speaking in Berlin and it was a historical moment that people wanted to share with other people. This is an example of the ubiquitous connection that we now enjoy and, in many ways, take for granted. It is a new way of thinking and it causes a lot of concern for people who want to stick to previous methods. (There will come a time when a paper exam for memorised definitions will make no sense because people have computers connected to their eyes – so let’s look at asking questions in ways that always require people to actually use their brains, shall we.) Steve then showed us a picture of students “taking notes” by taking pictures of the whiteboard: something that we are all very accustomed to now. Yes, some teachers are bothered by this but why? What is wrong with instantaneous capture versus turning a student into a slow organic photocopying machine? Let’s go to a Papert quote! “We learn by making“, Papert, 1960. Steve alluded to constructionist theory and pointed out how much we have to learn about learning by making. He, like many of us, doesn’t subscribe to generational or digital native/immigrant theory. It’s an easy way of thinking but it really gets in the way, especially when it makes teachers fearful of weighing in because they feel that their students know more than they do. Yes, they might, but there is no grand generational guarantee. It’s not about your age, it’s about your context. It’s about how we use the technology, it’s not about who we are and some immutable characteristics that define us as in or out. (WTF does not, for the record, mean “Welcome to Facebook”. Sorry, people.) There will be cultural differences but we are, very much, all in this together. Steve showed us a second video, on the Future of Publishing, which you can watch again! Some of you will find it confronting that Gaga beats Gandhi but cultures change and evolve – and you need to watch to the end of the video because it’s really rather clever. Don’t stop halfway through! As Steve notes, it’s about perception and, as I’ve noted before, I’m pretty sure that people put people into the categories that they were already thinking about – it’s one of the reasons I have such a strong interest in grounded theory. If you have a “Young bad” idea in your head then everything you see will tend to confirm this. Perception and preconception can heavily interfere with each other but using perception, and being open to change, is almost always a better idea. Steve talked about Csíkszentmihályi’s Flow, the zone you’re in when the level of challenge roughly matches your level of skill and you balance anxiety and boredom. Then, for maximum Nick points, he got onto Vygotsky’s Zone of Proximal Development, where we build knowledge better and make leaps when we do it with other people, using the knowledgable other to scaffold the learning. Steve also talked about mashing them up, and I draw the reader back to something I wrote on this a whole ago on Repenning’s work. We can do a lot of things with computers but we don’t have to do all the things that we used to do and slavishly translate them across to the new platform. Waters (2011) talks about new learners: learners who are more self-directed and able to make more and hence learn more. There are many digital literacies: social networking, privacy management, identity management, creating content, organising content, reusing and repurposing, filtering and selection, self presentation, transliteracy (using any platform to get your ideas across). We build skills, that become competencies, that become literacies and, finally, potentially become masteries. Steve finished with in discussing the transportability of skills using driving in the UK and the US as an example. The skill is pretty much the same but safe driving requires a new literacy when you make a large contextual change. Digital environments can be alien environments so you need to be able to take the skills that you have now and be able to put them into the new contexts. How do you know that THIS IS SHOUTING? It’s a digital literacy. and used the rather delightful neologism “Darwikianism” to illustrate evolving improvement on on-line materials over time. (And illustrated it with humour and pictures.) Great talk with a lot of content! Now I have to go and work on my personal learning network! 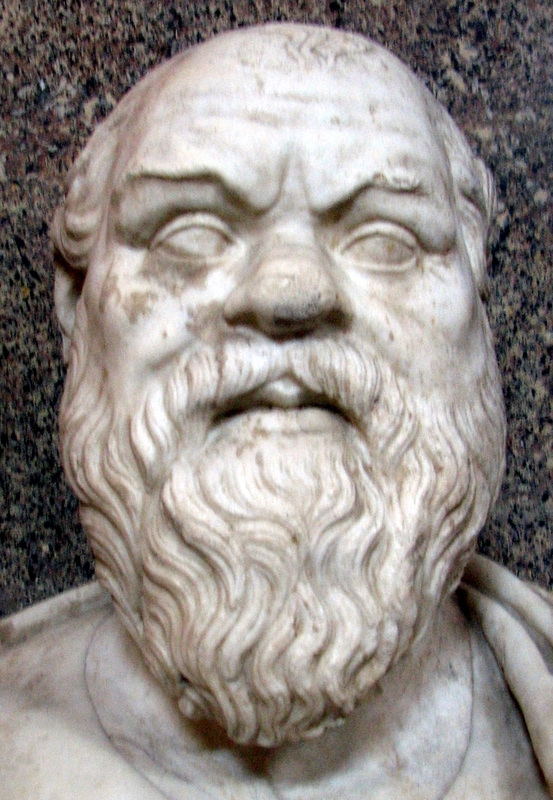 This is not actually Socrates. Sorry!